Painting, drawing and making things has always been a part of my life. My mother would knit and sew, she made clothes for my sister and I and taught me how to use a sewing machine when I was very young. Several members of my family, including my grandmother had worked in the glove-making industry based around Worcester at companies like Dents and Fownes - so making and sewing were sort of in my blood. When I left school I had a short career in office work (not my forte!). A more creative career called me, and in the 80's I worked as a fabric retailer and knitwear designer, selling my designs in the UK and abroad. In the early 90's I took the opportunity to fulfil a long-held ambition to study fashion & textiles, which I did at the U.W.E Bristol. My tutor was the embroiderer Janet Haigh, and it was her classes that inspired me to initially follow a textile-art route. After graduating I taught fashion and textiles. Today, although I'm still a great lover of textiles, I paint, working mainly in acrylics on canvas with the occasional addition of other media. I am influenced by artists such as Matisse, a lover of textiles, and the wonderful Mary Fedden. My style is quite naive and my work is all about my perception of the objects and places I paint. I may paint a still life, a window scene, a landscape or seascape - either way I am always trying to portray the way I feel about places and everyday objects rather than capture their exact visual reality. I love to explore colours and shapes and all kinds of things inspire me: ceramics, country cottage interiors, the coast, harbours, birds and the rolling countryside where I live. 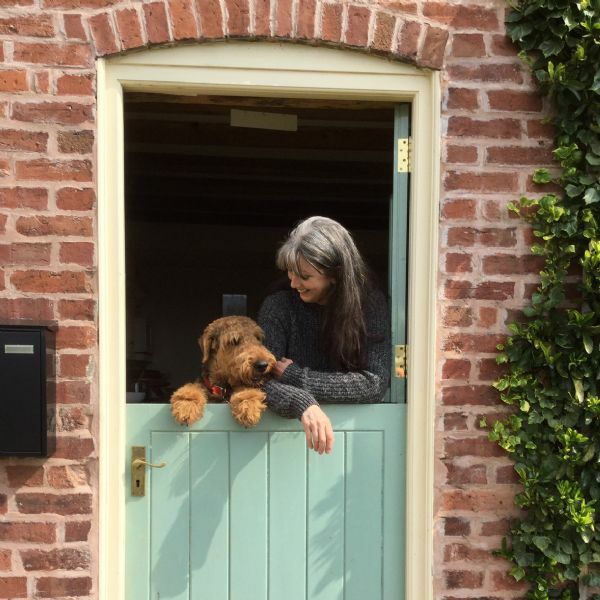 My home and studio are in the lovely Teme Valley, Worcestershire, which I share with my husband John, our young Airedale George (above) and a few happy chickens! Self-employed artist. A founder member of Worcestershire based Textile/Mixed Media group Upfront. Lecturer in HND Costume and ND Textiles. Knitwear Designer, trading as Gilly Moon, retailing in UK, Germany, Switzerland and Australia. Partner in Just Sew, Malvern, trading in wool and dress fabrics - later re-named Just So, trading in gifts and greetings cards. BTEC National Diploma in General Art & Design, The School of Art & Design, Barbourne, Worcester.